The eye works exactly like a video camera. Light enters through the front of the eye (the cornea) and is focused onto the back of the eye (the retina). 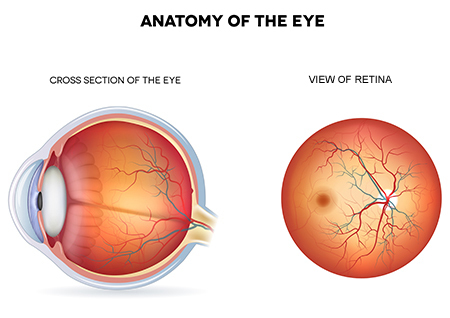 The retina captures the light where it is converted into an electrical signal and the visual information is then transmitted (via the optic nerve) to the brain for further processing. The most common problem with vision occurs when the light is not focused properly. Just like a camera that is out of focus, if the vision focus is imprecise, the world will appear fuzzy. There are two lenses in the eye that focus the light. The first lens is the cornea, the curved clear outer portion at the front of the eye. Because the cornea is clear, it is difficult to appreciate the cornea when viewing the eye straight on from the front. It is easiest to view the cornea when looking at the eye from the side. The cornea is curved, and it is the degree of curvature that determines the focusing of the light. More curvature (nearsightedness, myopia) and the light gets focused more; less curvature (farsightedness, hyperopia) and the light gets focused less. Irregular curvature (astigmatism) and the light does not focus precisely onto a single level at all. Deep inside the eye, right behind the brown or blue part (iris), is a second lens – the crystalline lens. This lens is designed to change shape in order to allow us to focus on objects that are near and far. For each different distance, the lens changes shape ever so slightly to enable the light rays to be precisely focused. As we reach the age of around 45, this lens becomes stiffer, making it difficult for the crystalline lens to alter its shape. For people over 45 years old, this can make it difficult to see up-close (farsightedness, presbyopia). Laser vision correction permanently alters the outer lens (the cornea) adjusting it microscopically to have just the right amount of curvature. The treatment uses a cold laser to gently remove a small, precise amount of cornea from either the center or the edge. The laser treatment does not hurt, correcting a lifetime of poor vision in just a few seconds!